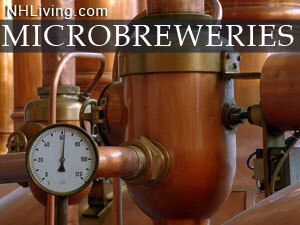 The New Hampshire microbrew industry has been gradually growing over the past several decades. This is due to the fact that New Hampshire has some wonderful microbrews. While some have been around for decades and are filled with history others are still fairly new and trying to become more well known. There are some real surprises that await you as you discover New Hampshire Brew Pubs and Microbreweries in nearly every region of the Granite state. To promote your business in NHLiving.com – New Hampshire’s Internet Magazine, please contact us. Throughout the ages cultures from all over the globe have brewed their own version of beer. While no two are alike their are categories that for the varying types. This ranges from pale to black and sweet to bitter. It is also defined in part by if the yeast is top or bottom fermenting and the types of hops, barley , and other seasonings that are put into it. German word for “old”. Altbier usually means a copper-colored, clean-tasting German Ale of the style especially associated with the German city of Dusseldorf. A smooth all malt beer with a well rounded hop character. For sociable drinking, or with appetizers of strong cheese of coarse sausage. The German glass used is similar to that used for a highball. Ideal serving temperature is just under 50F (10C). In Britain there are styles of varying degrees of sweetness. Initially brewed to compete with the pale ales. These go well with desserts or nuts. Belgium has a sweet-sour type made around the town of Oudenaarde. This type is more often served as an aperitif. Both are served at 55F; 13C. A very mild, sweetish, pale-golden to golden beer with a hint of fruitiness, fermented at warm temperatures with either “true” ale yeast or hybrid/lager yeast. Made in the North America as a response to the public’s increasing desire for lager. A sociable brew. Serve at 45-50F; 7-10C. Lager originates from the German word lagern which means “to store” and refers to the method of storing it for several months in near-freezing temperatures. A lager is usually used to describe bottom-fermented brews of Dutch, German, and Czech styles. Lagers can range from sweet to bitter and pale to black. However, most are a pale to medium color, have high carbonation, and have a medium to high hop flavor. Their are several strains of lager one of the more well-known is the pilsner or pilsener. American low calorie beer. A somewhat “lighter” version of the Pilsner style. Serve at 45F; 7C. The Munich brewers traditionally produce dark Lagers, with a spicy malt-coffeeish palate. The term “Munchener” is generally taken to mean this type of beer, which can go well chicken or pasta dishes. Today, the city also extensively produces pale Lagers, but with a distinctively malty accent. Sociable beers. Serve at 48F; 9C. Stout is a dark beer made using roasted malts or roast barley. It is generally darker, fuller bodied, maltier, and hopier than other ales. Stout Ale originated in Ireland as a variant of porter beer.